This is one of my reader's request. 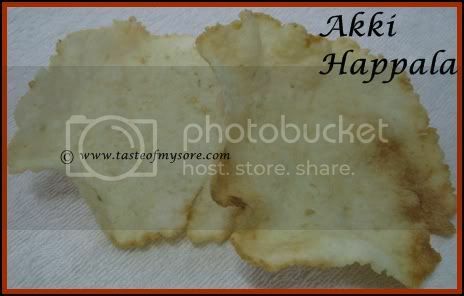 Here you go with the recipe of Akki Happala/Sun Dried Rice Flour Crispies. Dilute sour curd with 1 cup of water. Add salt, chilli paste and Flours. Mix and let it stand overnight. Add more water if required. 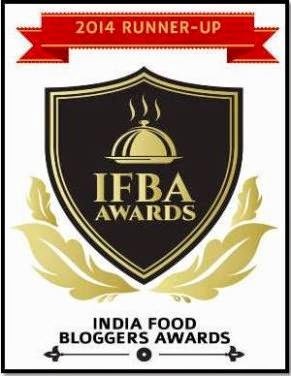 The batter should be of the consistency of Idli batter. Next morning make idlis out of the batter. Do not take out the all idlis from the plates. Take one idli at a time and let the rest stay in the cooker. Divide 1 idli into 4 equal pieces. Oil your hands and make small balls out of each divided piece and press it down to make disc or roll it down between two sheets of non stick paper/polythene. 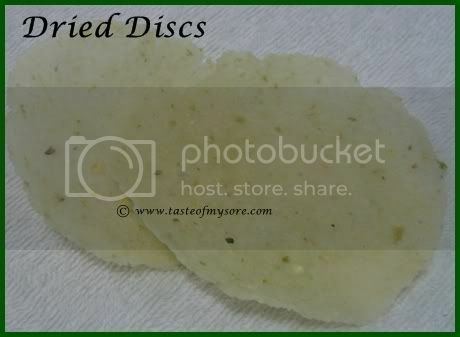 Arrange these discs on a thin cloth under hot sun and let them dry. It takes about 2 - 3 days for these discs to dry completely. Once dried store them in a airtight container. heat oil in a thick pan. When oil is sufficiently hot slowly drop in discs one after the other.Deep fry till they are crisp. Drain them on a tissue paper. yummm!! I really love these! Yr recipe is great! Summer andre haplada season alva!! Looks good. nice happala .. my MIL made sandige this summer .. so much fun making all these alva? vadagam looks yummy! Want to have a crunch! Lovely !! !i love this with hot rice..feel like having rite now! looks so good. Never knew this recipe. I have never made these home, just ate from friends place in India. Wish i could grab one. i love rice appalams..but hardly had them for a long long time..thanks for the recipe..
A family favourite !As a kid , used to love eating the "hasi" dough, before it was dried. My MIL makes this, nothing works better than rasam, happala combo on a rainy day..
Wow i was looking for this from a long time, thanks for sharing!! I love this :) Looks crispy and yumm. New for me..sounds yum...and looks gud..how do u make sago powder? Hey, LG! Dropping by to say hi & see how you were doing. Akki happla looks great! That's my fave happla. The hittu itself is so nice! I too made this but little different my recipe is looks nice. love this to have with sambar rice yummmmmmmmmmm. Wow you make happala at home! Hmm I will wait for summer to try this out. Hittu with bennae also sounds interesting!! Oh thanks so much for this recipe! Will try it out over the weekend! 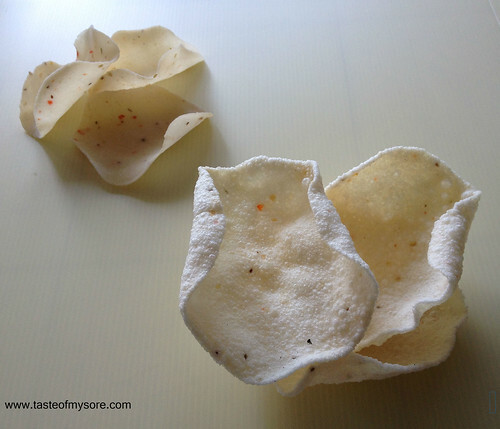 can we dry them by any other means..
like using a hot air oven..
can we dry them by other means like a hot air oven etc etc..
@Shyam, I have not tried drying with hot air oven. I thought such kind of equipments were for lab only :D However, you can try and let me know the results.